The men in this photograph were responsible for three seminal events in 1938. The first was the organisation of Parramatta’s sesquicentennial celebrations. Work on this had started 4 years earlier and the thousands who lined the streets were testimony to its success. 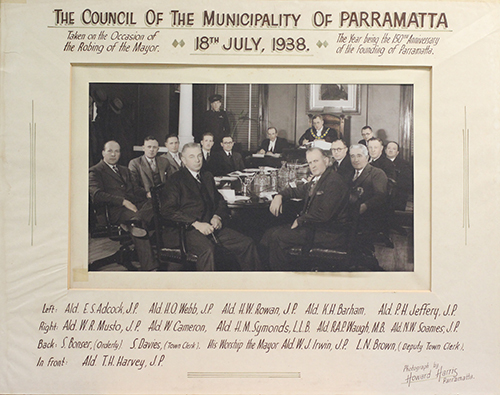 The second was the successful campaign by the Mayor and Aldermen for Parramatta to be recognised as a city. This occurred on 27 October 1938. To commemorate the event the Parramatta Council also published a book which covered the 150th celebrations and paid tribute to the aldermen who had helped organised the event. Titled 'The City of Parramatta 150th Celebrations', it was edited by the local historian and President of the Parramatta Historical Society, James Jervis, and contains some interesting biographical information on each of the men in this photograph. Mr. Sydney Davies was a native of Parramatta and the son of the late Mr. John Davies, who was at one time headmaster of Parramatta North Public School. He spent his working life in the Council’s service, and at the time this photograph was taken had been working in Council for forty-nine years, during which he had been Town Clerk for thirty three. Mr. Davies, was Secretary of the Celebrations Committee and and an inveterate autograph hunter. Apparently no visiting “lion” had a chance of escaping him.